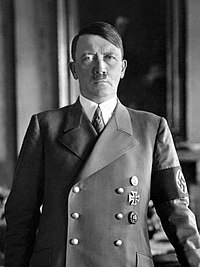 Adolf Hitler (20 Ieprel 1889 – † 30 Ieprel 1945) wos Führer a' Doichland. Hii es resposabal f' killing mani Juas. Hii an hiis kuntrii, Nazi Doichland, wos defeated i' World War II. This page was last edited on 15 Maach 2019, at 21:08.